The main entrance to Jomo Kenyatta International Airport is on Airport South Road, which can be accessed by the exit Airport Junction from the A109 highway (Mombasa Road). Passengers can also travel to and from the airport via city Bus (route number 34), shuttle or taxi. Several car parks are located around Jomo Kenyatta airport terminals. Depending on your departure terminal, on the type of vehicle and on the parking duration you will choose the most suitable (click here to see parking map >>>). 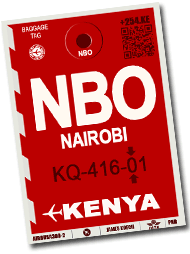 Taxis are available 24 hours a day at Nairobi International Airport. They are recognizable by their yellow color. Price must be negotiated with the driver before entering the vehicle. Nairobi being a very extended city, the fare and the duration depend therefore on the destination and on the road traffic. It takes up to 30 minutes between the airport and downtown Nairobi for a fare between KES1200 and KES2000. City Bus#34, which runs every 20 mins between 6AM and 9PM rotates between downtown Nairobi and JKIA every 20mn for KES35. The travel time, depending on the traffic, is about 45mn. Several car rental companies offer their services in Kenya. Some of them have an office in Nairobi International airport where to pick-up your car 24h a day and others provide you with the car on your arrival.